This post has been updated to (hopefully) give you real-foodists even more helpful ideas to save money. 🙂 It contains affiliate links- that means if you make a purchase through a link, I get a small commission at no extra cost to you. Thanks so much for your amazing support. Love buying organic but hate the price? I feel the same way. I cringe when I see a sticker that’s double, sometimes even triple the price of conventional food. However, I still feel it’s very important to avoid pesticides and GMOs as much as is possible within my limited budget. So what’s a girl to do? 1) Check for markdowns. My local health food store has a basket of marked down organic produce at the end of the aisle. Once I scored organic pink lady apples for $0.49/lb, 6 oz. of organic pre-sliced portabella mushrooms for $0.99, and organic broccoli sprouts for $0.99. 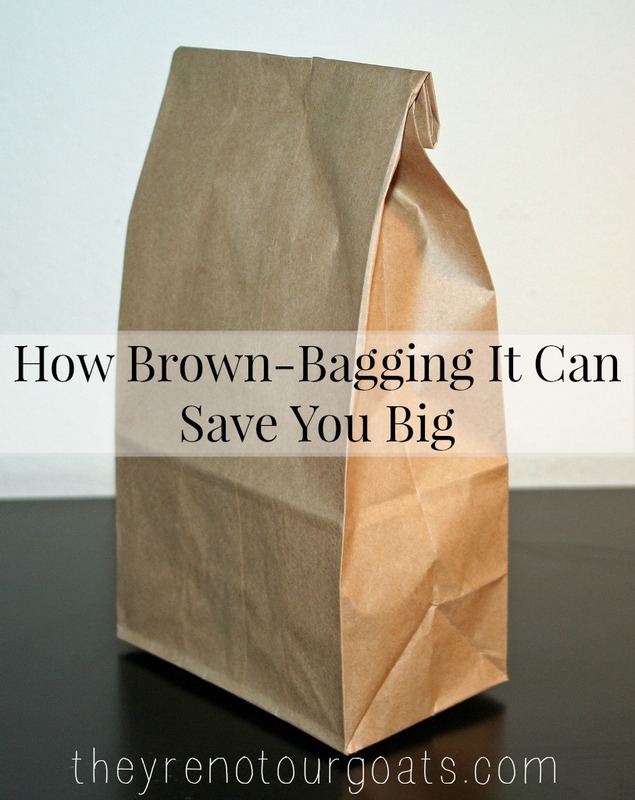 Slightly blemished or less fresh produce can save you big. Also, check the meat aisle for cuts close to their “use/freeze by” dates. I’ve gotten organic, grass-fed ground beef for less than conventional beef this way. Just be willing to be flexible with your meal planning in order to make the most of your discounted finds. 2) Compare local farmers. Farmer’s markets can go either way. Sometimes the price is jacked up, and sometimes it’s very reasonable. However, it’s entirely possible to buy quality food for less from an individual than from a grocery store. For example, I’ve bought my organic pastured chicken eggs for $3.00/dozen from a local lady rather than the standard $5.00+. 3) Look for “organic practices.” When shopping from a farm stand, you can always ask about their practices. Some farmers don’t use pesticides but aren’t certified organic yet. Consider all aspects of crop management: pesticide usage, GMO’s, crop rotation, soil management, etc. You can often get a more affordable product that is still much healthier than conventional. 4) Buy in bulk. Buy a 1/4 of an organic, grassfed cow to put in the deep freezer for the year. It will definitely save you cost per lb. Or purchase a whole bushel of organic apples and can them or store them for winter use. 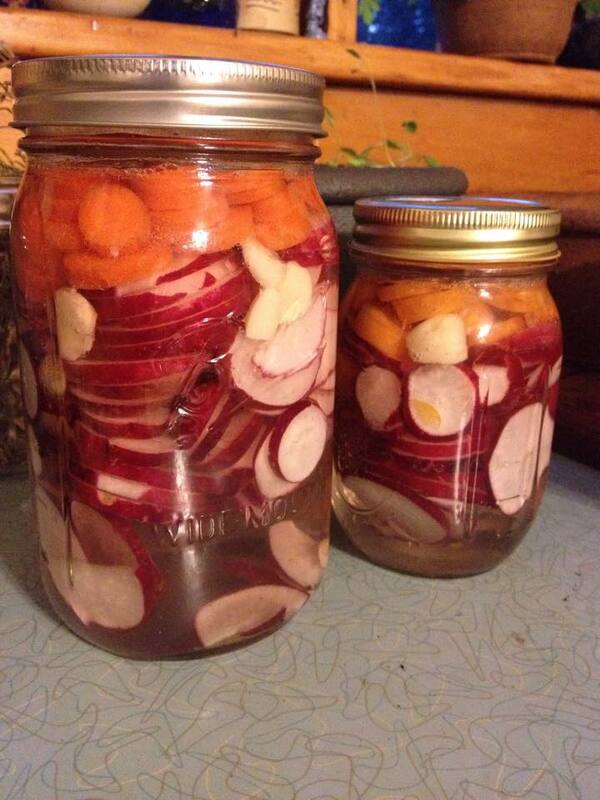 5) Consider an organic CSA program. Community Supported Agriculture boxes are getting more and more popular. Basically, you buy into a season’s worth of produce from a local farm at a discounted price for buying in advance. Most CSA programs also require you to put in a work commitment at the farm as part of your payment. 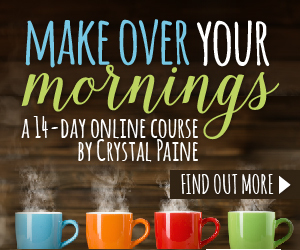 This can be a fun and educational process for families who care about knowing where their food comes from. 6) Check big box stores. Okay, so I’m all for shopping local. I really am! But sometimes the prices of organic food are ridiculously high at a specialty health food store. If I just can’t afford it, I’m willing to look around. Oftentimes, you can find at least some organic variety at big name stores, such as Walmart, Target, or Costco. 7) Check discount stores. We have an area discount grocery store that offers tons of organic options on average at 40-60% off. It’s worth checking if you have one nearby. 8) Try a membership site like Thrive Market. Think of applying a Sam’s Club membership principle to specialty organic products, and you’ve got the idea of Thrive. 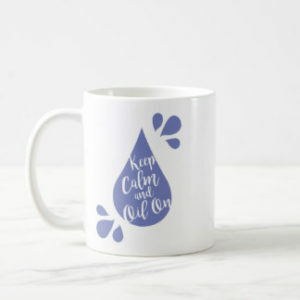 I don’t buy from them frequently because I make so many things from scratch (so I don’t usually need pre-made organic tomato sauce), but for the things I do need (natural laundry and dish soap that actually work, for example), I’ve found Thrive to be less expensive than other discount sites like Amazon. I tend to place a bulk order every few months to fetch those things that are hard to find elsewhere. UPDATE: Besides gardening, we’ve also found raising animals to be a valuable part of reducing our grocery bill. As mentioned before, our laying hens give us organic, free range eggs at a fraction of the price of similar store-bought eggs. 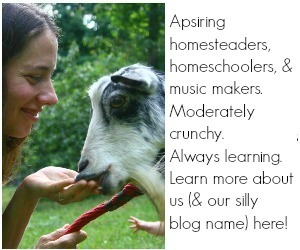 Our goat gives us delicious raw milk and the cost of her feed is less than keeping a cat (though whether or not we’ve saved money on her overall is debatable). We are also hoping to be able to process more of our own meat in the coming year. 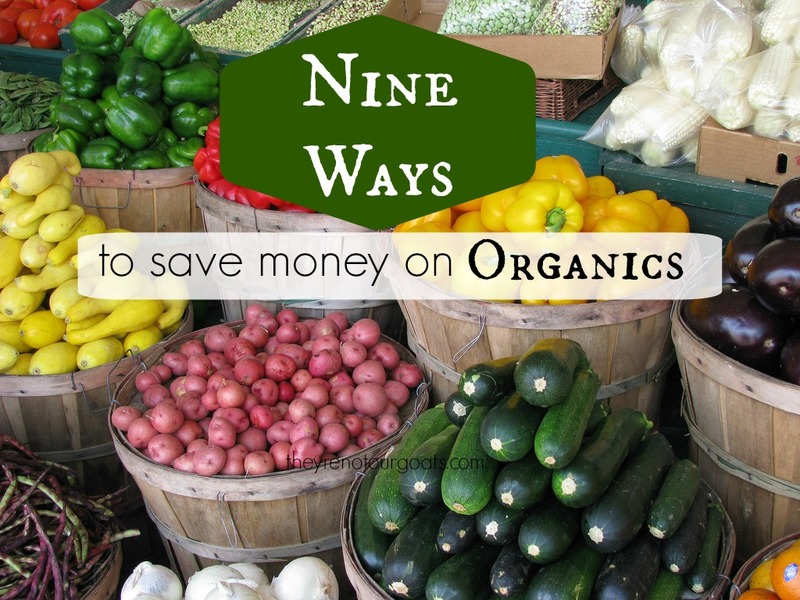 How do you save on organics? What’s the best deal you’ve gotten? Share in the comments! This entry was posted in Frugality, In the Kitchen and tagged cutting grocery bills, how to get organic food for less, Nine Ways (and counting) to Save Money on Organic Food, organic food on March 28, 2016 by Abi. I am made increasingly ill each passing year by all the consumerism that comes hand-in-hand with Christmas. There’s too much plastic stuff we don’t need, a spirit of I-must-have-it-all-and-then-some, and far more spending than is necessary. While I enjoy the gift giving itself, I am downright sick of the commercial craze. Why can’t we find free ways to enjoy Christmas? Ideally, I would spend my December enjoying the season instead of worrying about gift giving and receiving. I would love to just be content to read Christmas stories, cook festive meals, decorate the tree, and sing carols. I’m not against a gift exchange at all! I do love a sweet small exchange of meaningful gifts among family or close friends. However, I don’t like how easy it is to fall prey to excessive spending each Christmas season- and how much the gift buying can take our focus off of what’s more important. 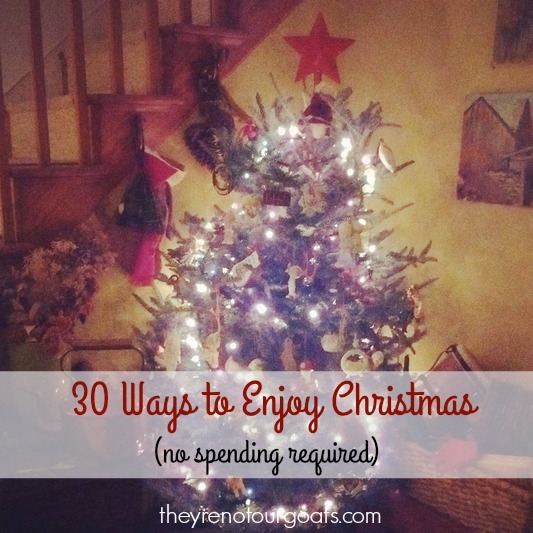 This entry was posted in Frugality and tagged Christmas, free Christmas activities, frugal, frugal Christmas, Thirty Free Ways to Enjoy Christmas on December 18, 2015 by Abi. I pull into the outdoor shopping mall to meet my friend for lunch. I park my 18 year old van with the sheet metal patched over a formerly rusty hole next to some shiny new SUV I don’t take the time to recognize. I walk inside the restaurant and see the leggings, boots, and designer handbags adorning the women in line. I’m swimming through a crowded sea of perfume and name brands and chai tea. I spot some possibly vegan yogis who look gorgeous despite their recent workout. 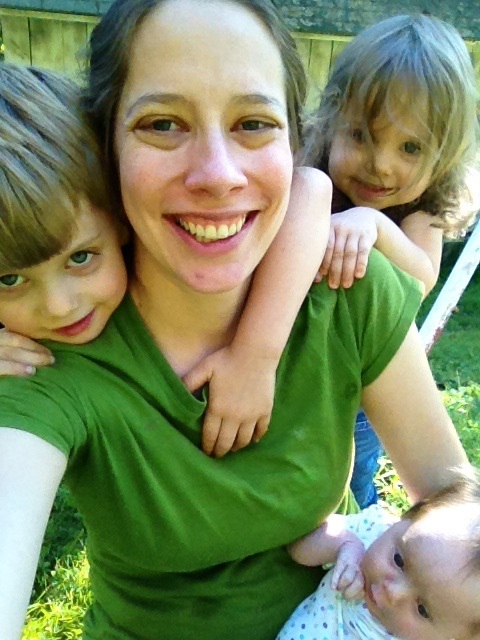 I’m keenly aware of the raggedy gape in the knee of my left pants leg, the worn-out Birkenstocks I’ve had for years, and the circus of juggling spit up, screaming, and strollers. My family is anything but trendy at the moment, and I feel hot and unkempt in my one-size too big puffy coat. I manage to survive the meal with a minimum of dropped food and temper tantrums and make it back to the car in one piece. I’m know quite well that everything I own is either old, second hand, or half-worn out. Most of the time I don’t mind at all. In fact, I’m often rather proud of the fact that I don’t need your fancy watchamacallit that will make me prettier, smarter, or more put-together, thank you very much. But sometimes (only sometimes) I wish I could just afford the dark coat that fits well and has a secret pocket on the inside. Sometimes I wish my car wasn’t from two decades ago. Sometimes I wish I could invite a stranger to my house without apologizing for the torn brown and yellow 70’s linoleum that doesn’t match the blue 50’s boomerang pattern on the countertop. Sometimes I wish I could go to work in clothes that I actually bought from a store and weren’t passed down to me– you know, the ones that fit well, and that don’t have tiny holes or stains. Sure, it would be nice to have the boots, the tech, the new gadget and the car that drives like I’m really somebody going someplace important. My house might make friends feel more comfortable if I had, say, a furniture set. Or a dining room table. Life would certainly be more pleasant if my children looked more like a baby Gap poster and less like a hoard of monkeys. But think about it. Wouldn’t that be awful if that was what I spent my whole life yearning after? When I catch myself wishing that I could just have a little bit nicer stuff, I get disgusted with it all. Why is it so important to us as a culture to look good? What is with our obsession to have just a little bit more stuff, to make our lives a little bit fancier, a little bit more convenient? I may not be able to afford clothes I really love, but I have a closet full of clothing appropriate for various social situations. I may not have the beautiful coat that fits perfectly, but I have four–count them– four coats that I could wear out at any given time. I have shoes, I have reliable transportation, and I have a comfortable roof over my head. Am I really that bad off? Let’s take a step back from all this consumerism and envy and keeping up with the Jones’s. Can we just make do with what we have? 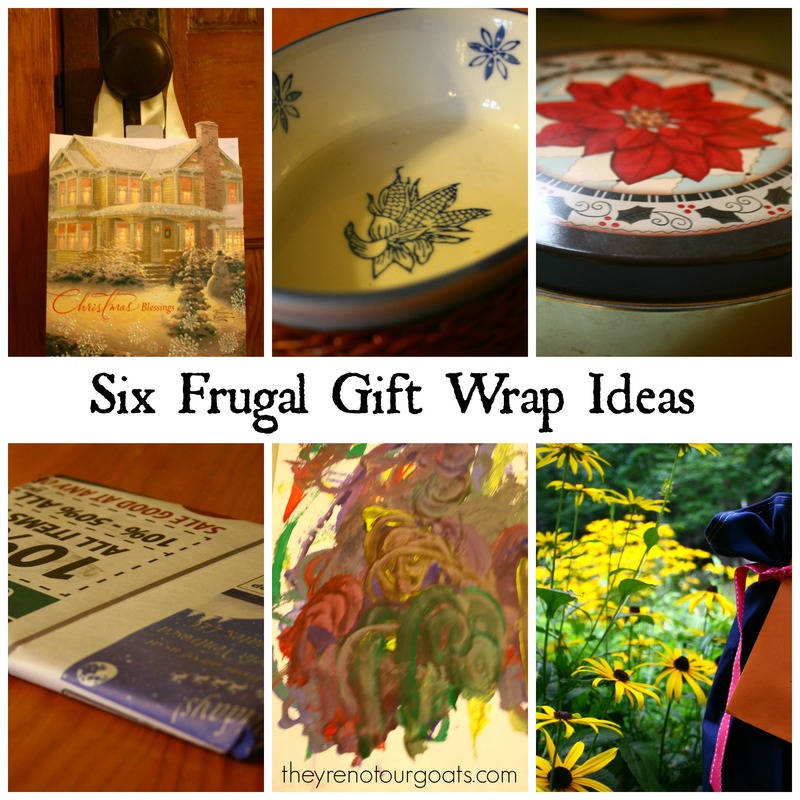 This entry was posted in Frugality and tagged frugality, Let's Just Make Do on December 4, 2015 by Abi. I’m often surprised when I look at budgeting worksheets to find clothing as a regular category. 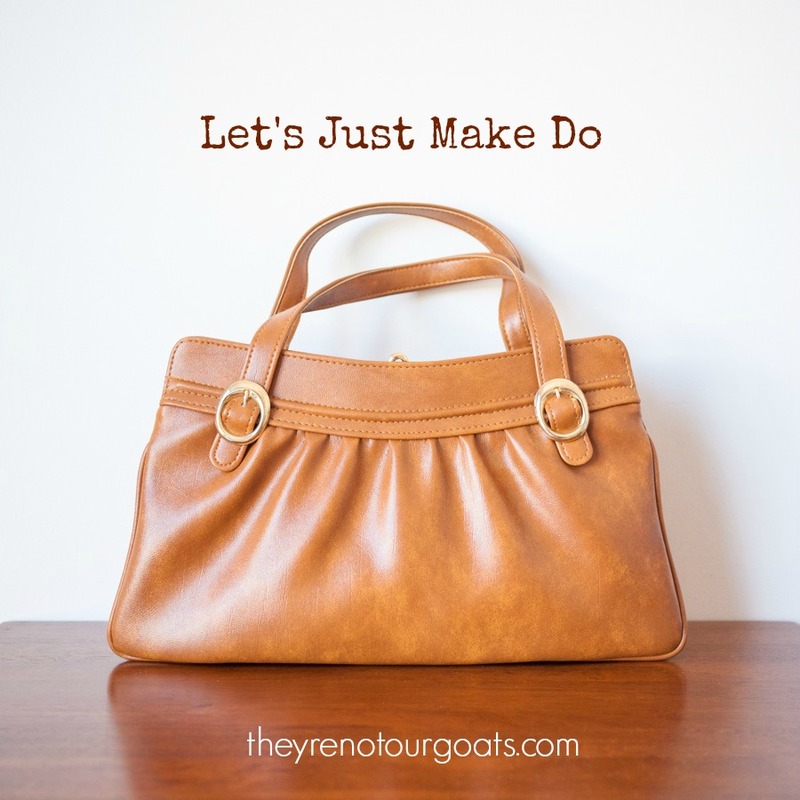 People actually budget to buy clothing?I guess normal people do- but maybe I’m not normal. 😉 Our clothing budget has almost always been zero. 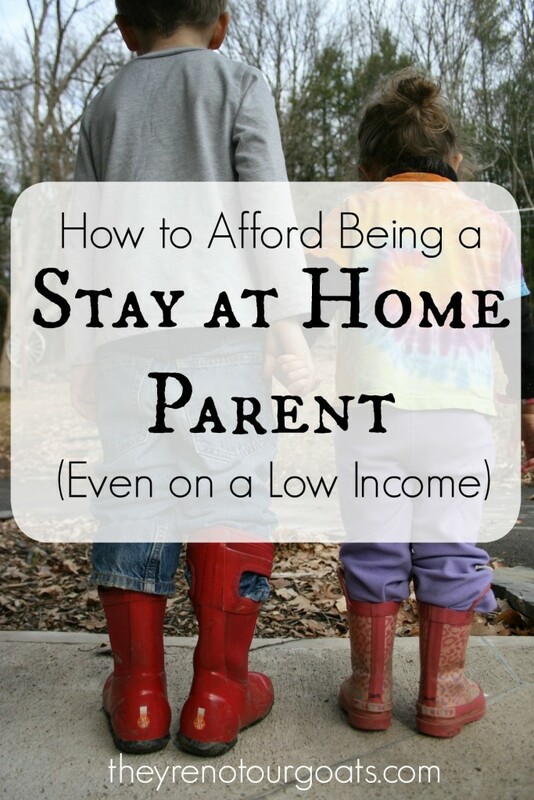 Bear in mind that I am not fancy, and I’m home with the kids most days. 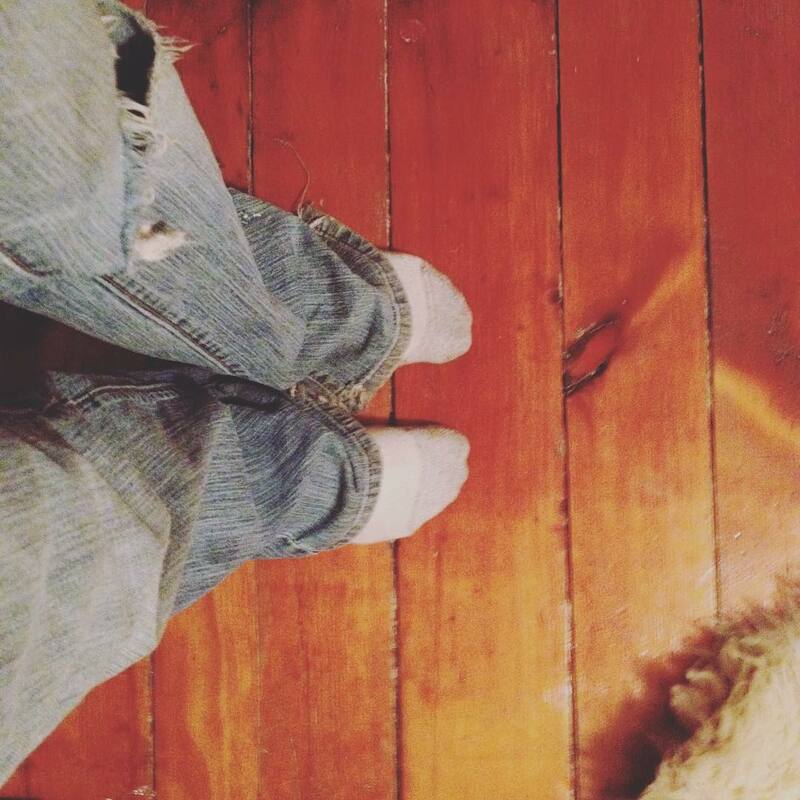 However, even jeans can be expensive, and mine wear out quickly from being on my knees a lot. My husband’s work clothes wear out about 10x faster than mine, as he is usually doing about 10x more hard labor than I am. However, I do still need some professional clothing for teaching, performing, and at least something semi-presentable for church. My husband needs dress shirts and pants for his middle school gig. 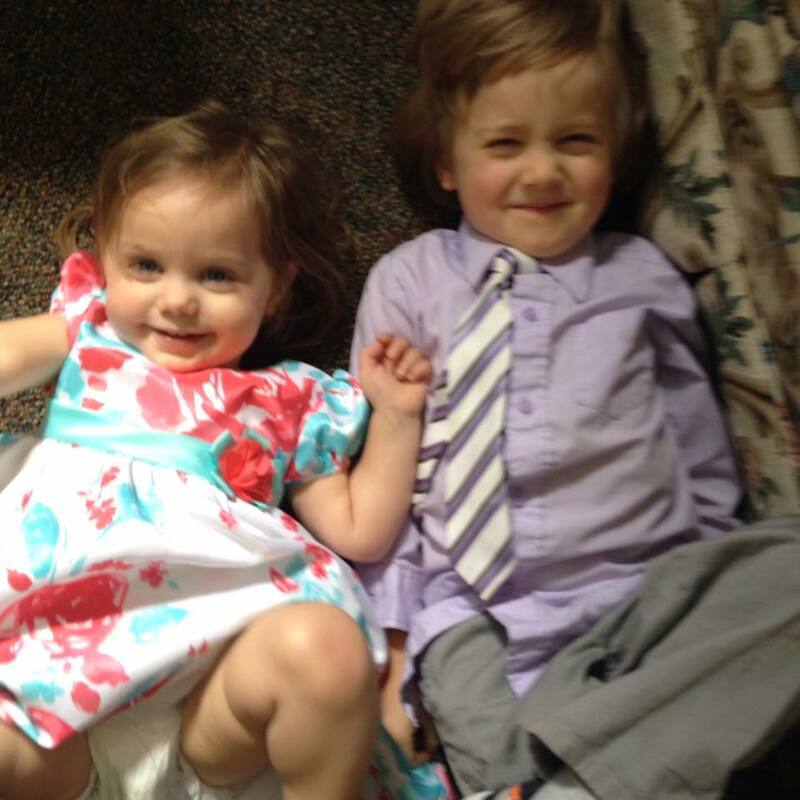 The kids can go about in pretty much anything, but I also find that they’re the easiest to clothe for free. Today I’m going to give you some ideas for clothing your family on very little money. Some ideas will work for you better than others depending on your job and age of your children. That’s okay- just take what works and leave what doesn’t. 1) Thrift Shops- Some folks would never in their life buy something from a thrift store. But me? Salvation Army is one of the first places I check. I’ve scored like-new dress pants for each of us for as little as $2. My husband got a down-filled Structure winter coat for $3 once. Our kids have gotten many pairs of shoes in nice condition that last them through the season, all for a much lower cost than buying them new. 2) Consignment stores– Often, you can find clothing that costs slightly more than a thrift store, but is also in like-new condition at your local consignment shops. Added bonus? You can consign your old clothing while you’re there to get a little extra cash in your pocket. 3) Online Consignment- I’ve found some great deals and freebies on spectacular clothing in perfect shape by searching online. 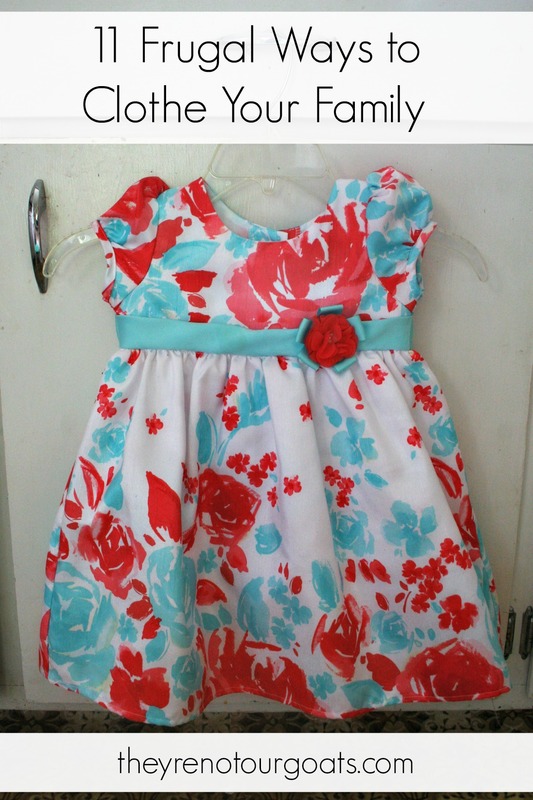 My favorite online consignment shop is Thred Up, which focuses on women’s and kid’s clothing. Thred up also offers an awesome referral program, which I get to pass on to you! Click this link for $10 to use at Thred Up. No additional purchase necessary. You’re welcome. 5) Shop yard sales. I’ve found nice winter jackets and brand new kids clothes (with the tags still on) for a dollar or two a piece. It’s hit or miss, but it doesn’t hurt to look. 6) Host a clothing swap. My favorite idea. Gather a bunch of friends in varying sizes, and have everyone clean out their closet and bring what’s still in good condition. Categorize items (either by size or style), and you can all “shop” each others’ stashes. I got some nice jeans, shirts, a dress, and cute sandals this way. Don’t want to make it an official event? Just trade clothes with a friend who is the same size for a wardrobe refresher. 7) Smart shopping– When all else fails, don’t hit retail stores planning to pay full price. Come armed with coupons, gift cards, sale flyers, etc. Check the clearance section. 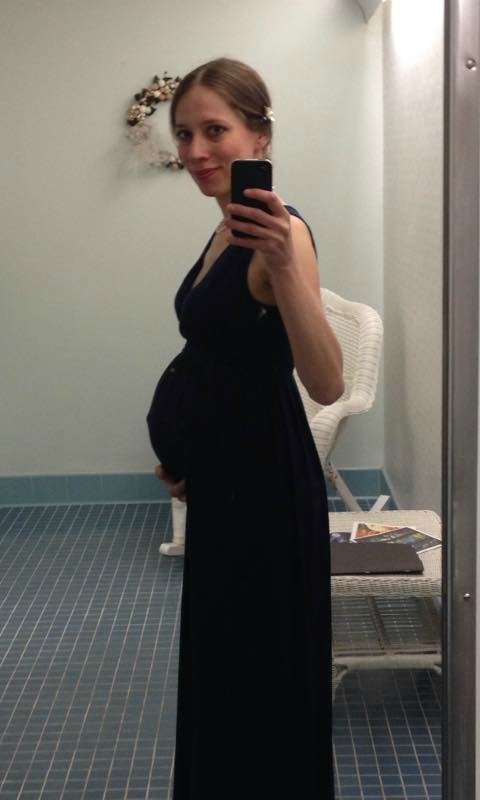 I got myself a cute maternity dress for $14 instead of $35 because of an old gift card and a sale. Do I have an item at home that’s similar? How frequently would I wear this? What else could I spend this money on? 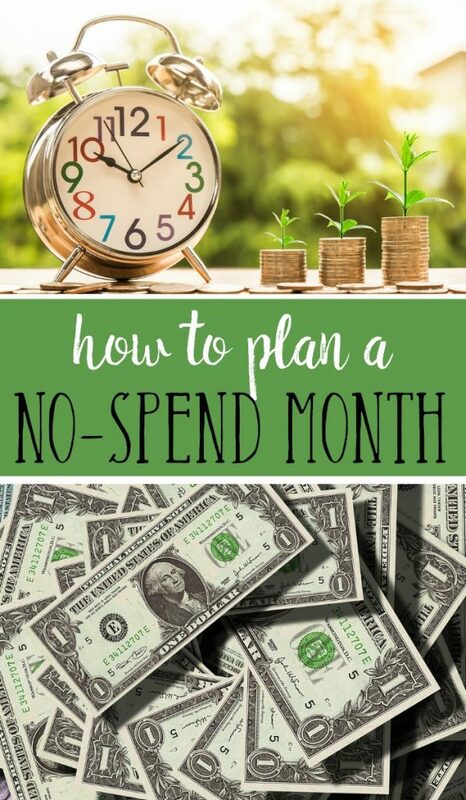 I’m not trying to be a damper on everyone’s fun, but when saving money is a priority, it’s good to ask yourself realistically if it’s a true necessity before you splurge. 10) Repair what you have. It doesn’t take much to sew a button back onto pants, stitch up an open seam, or patch the knees on your toddlers’ pants. Few of us repair our clothing these days. However, before a time of so much excess, clothing repair was an absolutely necessary skill. Consider a few simple repairs with a sewing kit before tossing a worn-out piece. 11) Keep what you have longer. If it ain’t broke, don’t fix it. Take care of what you have. I’ve had dressy clothes that last for years because I just don’t update. If you can still swing it, keep wearing it. A word on teenagers: Some people say that their teens are difficult to clothe inexpensively- and this may be true, depending on their preferences. Not yet being the mother of a teen and having no idea what I’m talking about, I would encourage them to look at saving money on clothing as a fun challenge. See if they can find a unique piece that’s just their style at a thrift store. See who can find the lowest price on Aeropostale jeans at the consignment shop. (Or wherever kids think it’s cool to shop these days.) See if they like the idea of hunting for a cute designer dress on Thred Up instead of buying retail (where all their friends are buying the same old, same old). See where I’m going with this? It may or may not work for you, but it’s worth a shot. 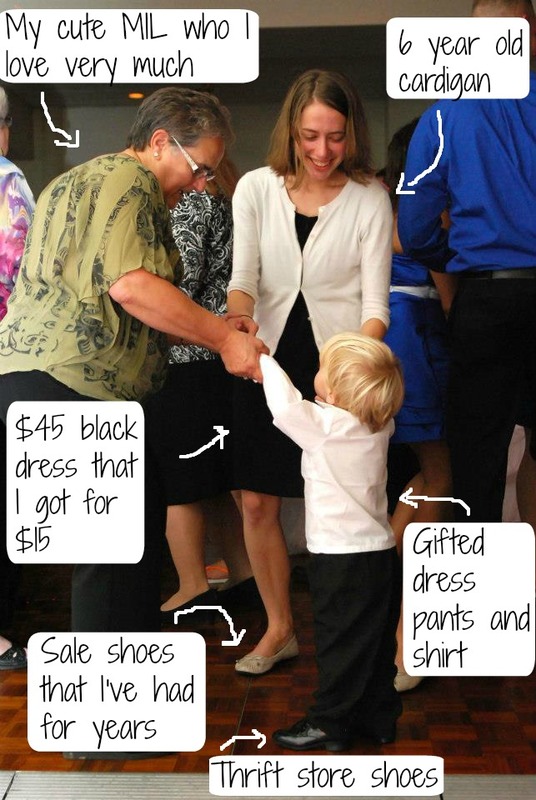 By clothing my family in this way, I probably spend less than $50-$75 a year on clothing for all of us. 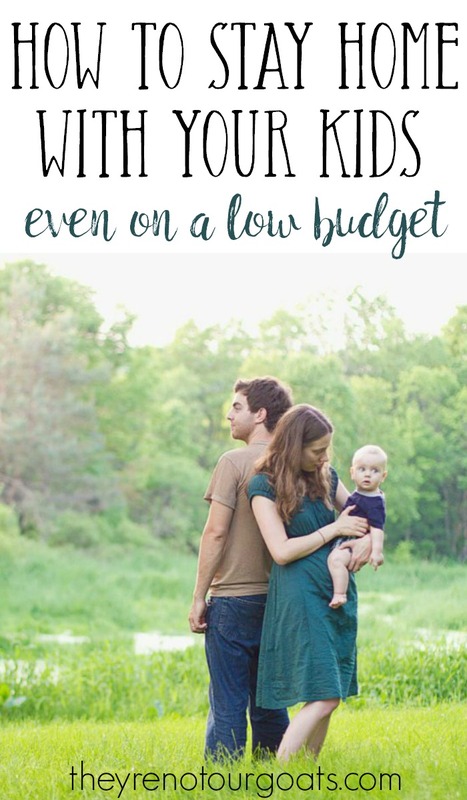 I know I’m a cheapskate and not everyone would be happy with getting dressed this way, but probably most people could find something on this list that would help to save them a bit of money. What’s your top tip for saving money on clothing? Leave it in the comments below. 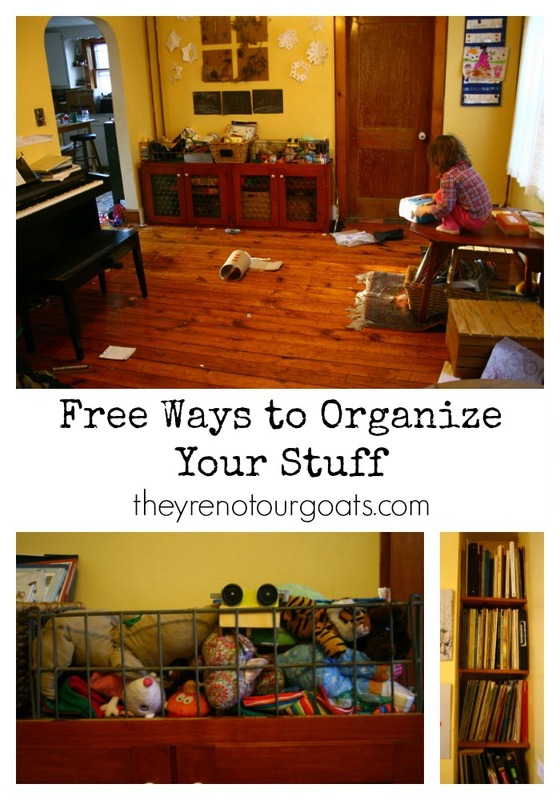 This entry was posted in Frugality and tagged $10 to Thred Up, 11 Frugal Ways to Clothe Your Family, clothes, free, frugal on July 17, 2015 by Abi.